Today, teachers everywhere are using technology to expand the classroom — helping students see more ideas, get involved in more discussions, and learn at the pace that’s right for them. The flipped classroom is far from the only pedagogical innovation technology has enabled, but the initial success of so many early inverted classrooms has made this model certainly one for many educators to consider. As with any classroom evolution, there are dozens of practical implications that must be considered and managed in order for change to succeed. For the flipped classroom, along with lesson planning, student expectations, and administrative buy-in, the supporting technology that makes inverted lessons easy to produce, share, watch, and search is certainly a factor that must be planned for. While early adopters have often cobbled together technology solutions to support their own flipped classrooms, today’s flippers may find it beneficial to take a more holistic approach. Video platforms, often already in-place at many schools and universities, can be a simple one-stop resource for flipping the classroom — making it easier to utilize video and enabling teachers to focus on teaching, instead of technology. For institutions planning on flipping, here’s how you can address both requirements. It’s never been easier to create a video. Video cameras are now standard on virtually every smartphone, tablet, and laptop on the market. High-quality webcams can be purchased for less than $100. Even high-end, studio-grade equipment is becoming more affordable. Too many schools, however, have restricted their instructors’ ability to create a video recording. Some insist teachers record only with AV specialists or in dedicated recording studios — where quality may be controlled but limited availability makes it difficult for educators to schedule a time to record. Others require teachers to record video using fixed hardware installed in certain classrooms to capture lectures. These tools, however, are generally built specifically to record the very classroom experience — traditional lectures — that the flipped classroom seeks to reinvent. Flipped lectures are often delivered more personally, and focus on a particular topic or demonstration. A fixed camera in the back of a lecture hall can’t typically support recording all of the different scenarios a flipped classroom instructor may require in a given semester. Besides slowing down the video creation process and introducing other unnecessary hassles, specialized onsite recording hardware introduces an even more fundamental problem: lack of mobility. These stationary or device-dependent systems can’t be taken home with the instructor … or to other remote locations from which lessons and demonstrations can be recorded. Enabling instructors to record with their own devices and allowing teachers to record from anywhere effectively makes the world their classroom. Equipped with nothing more than their own smartphone, instructors can record course content from museums, field trip destinations, experiment labs, their own home offices, and virtually anywhere else. Best of all, many video platforms for education are built with mobile video in mind — automatically recognizing virtually any recording device, including laptops, webcams, mobile devices, HD camcorders, IP cameras and more. Better still, those tools connect directly to a video CMS, making it easy for instructors to instantly upload, manage, edit, and share anything they’ve recorded — no matter what device they used to record with. Sometimes a single video feed just doesn’t cut it. Sometimes an instructor wants to show another angle — getting up close for a demonstration, capturing each participant in a debate, or recording multiple breakout group activities simultaneously. Sometimes it’s essential to add materials to supplement the PowerPoint — a screen recording, or additional graphics, or an interactive quiz. In the past, educators had two video creation choices: capturing a single video stream themselves using a basic camcorder or webcam recording whatever was in front of it, or shelling out for high-tech, professionally produced multi-camera video capture — with all the cutting, splicing and other AV editing required. Today though, there is an easier way for academic institutions to easily incorporate all of their demonstrations, images, scenes, and presentations into a single video recording—and to easily edit those videos themselves. Some video platforms in place at schools today already allow for additional video streams, screen captures and other multi-media add-ins. Schools using Panopto can enable their educators to record or upload a virtually unlimited number of additional video streams — and automatically sync them into the same recording. With multi-camera recording, instructors can tell almost any story they want to tell, no matter how complex or creative it may be — all without requiring the help of AV specialists. 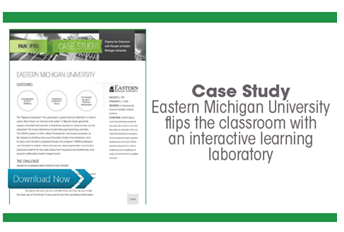 Take a deeper look at the flipped classroom evolution, including the foundational strategy and early results that have so many teachers excited, in our latest white paper, So You’ve Decided To Flip Your Classroom.